Strengthen your team—and your business—by equipping agents with digital tools to empower and engage. Back in 2010, the top three contact center problems were widely recognized as absenteeism, staff attrition and, crucially, lack of employee engagement. Much has changed in the last seven years, but while tech changes, people don’t. Their well-being, engagement levels, knowledge and brand literacy remain at the heart of your success—or failure. Today’s workers expect to be equipped with the best tools available to do their job. That means communications and technology that empower them to make autonomous decisions about what is best for the customer. They also want to feel part of something bigger, and to be listened to and given constructive feedback on their performance. Fortunately, technology has expanded exponentially to help them—and you—do just that. In addition to these technology developments, digitization is fast becoming a whole new layer in the infrastructure of our existence and understanding. It’s inevitable, therefore, that more devices and apps will infiltrate the workplace and become preferred choices for communication. However, incorporating too many of these new developments can also introduce confusion, pose security risks and prove a significant distraction for your agents. So how do you reengage your workforce by taking advantage of today’s rapidly growing and converging technology trends, while ensuring security and seamless processes? What Does Your Workforce Want? According to Verto Analytics’ research, among an American sample, the typical adult owns an average of five different devices and spends more than 74 hours per month on their smartphones, and more than 37 hours per month on their tablets. It should come as no surprise then that omnichannel was the top contact center trend in 2016, according to Dimension Data, with full channel integration levels set to triple from 22% to 75% in the next two years. Increased customer service-related messaging from apps and social networks. With an increasingly tech-savvy workforce, many employees want to use the same tools at work that they utilize in their home lives, so contact center leaders need to take notice of this preference. The mistake is weighting this reaction too far in the direction of the consumer; neglecting the fact that employees are also members of “Gen Mobile.” Surely, great customer experiences can best be delivered by agents who are enjoying an equally positive and engaging employee experience. This can only be enabled through the technology that supports meaningful, efficient interactions with the customer. For example, an ideal user interface for contact center agents would seamlessly integrate channels and customer information in a modern and easy-to-navigate desktop, with an effortless transition between chat, voice and web. In short, modern workers expect tools to mirror their experiences outside of work. It’s our role as employers to give it to them. According to Gallup, 87% of employees worldwide are not engaged at work, and companies with highly engaged workforces outperform their competitors by 147% in earnings per share. Quite simply, there has never been more reason to make work more purposeful to employees. The fact is that expectations have evolved from both sides of the consumer equation. Customers expect a knowledgeable, productive person to interact with, but that means contact center leaders need to motivate and empower their people, whether that’s through incentives or other ways for them to become better invested in the organization and have increased brand literacy and advocacy. In other words, a greater ability and desire to positively reflect and extend the familiar values of a brand that consumers initially pick up from advertising, marketing and word-of-mouth. This will be the greatest challenge for contact centers with high staff churn rates. Then again, they also have most to gain! Contact center leaders continue to cite agent attrition as one of the most important issues facing them today and unfortunately, there is no secret formula to fixing this issue. But, tools that help improve engagement, empowerment and leadership skills can provide immediate impetus and the right direction to follow. Getting the right, comprehensive, real-time information to employees so they can make smarter, faster decisions is paramount to creating more personalized interactions with customers. This is where unified communications and collaboration technology comes in. UCC solutions can facilitate team chit-chat, private messaging, voice, video calling and conferencing, and file sharing. In fact, in terms of personal organization and record-keeping, it can work better than physical interaction when Threaded Communication (TC) technology is employed to join it all up in a logical, clutter-free manner. TC is part-and-parcel of UC, rather than something new to steal its crown. It stores and dates each user interaction so the perpetual “now, where were we?” question becomes a thing of the past. Essentially, it’s a single tool for communication through which users can pick up any previous interactions and continue from where they’d left off. Rather than instigate a new conversation each time you contact someone, you just pick up the same interaction, the same thread, and continue exactly where you left it. This significantly reduces the frustration that customers commonly cite when “channel-hopping” during their interactions. It also provides the perfect environment for agents to participate in flexible self-training, either individually or working together as a group. The Digital Workplace: If You Don’t Create It, Your Workers Will Anyway! According to “The Value and ROI in Employee Recognition,” by Human Capital Institute, when employee engagement increases, there is a corresponding increase in employee retention by up to 87%. One of the ways that leading organizations are driving greater engagement is through digital transformation. UC is an extremely popular project within the realm of digital transformation. Advancements in UC technology over the past decade have allowed workers to communicate across different interfaces and platforms. As organizations undergo broader digital transformations, it’s an opportunity for contact centers to introduce a UC strategy that ties everything together and allows for a more communicative workforce. Those who don’t get onboard with this movement will be left behind. Smaller, nimbler organizations are undoubtedly leading the charge, with a few notable exceptions. In short, larger organizations cannot afford to wait. The sheer amount of information created and processed every day means that, the longer an organization takes to embrace digital transformation, the harder it’s going to be to uproot current legacies and processes when they do eventually embrace it. Furthermore, if you’re not already championing the digital workplace, chances are your agents are already doing it without your say-so. In the same way the BYOD trend was causing headaches for IT managers around the dawn of the smartphone, we are seeing a multitude of communications platforms disrupting how organizations process information and keep everything secure. The likes of Skype, Slack and even Facebook Messenger are popular and useful, but many organizations have little control over them short of mandating employees with a list of draconian rules. Well-meaning employees motivated only by a desire to be more productive and helpful are using disparate communication applications, or downloading unvetted services, that can pose serious data security threats or a breakdown in data protection compliancy. In an attempt to fill an obvious service gap, your best people could be undermining your entire business. The global cost of cybercrime will reach $2 trillion by 2019, a threefold increase from 2015 levels, according to research by Juniper Networks. IT departments have a hard enough job as it is keeping IT infrastructure secure, without the creation of a soft underbelly in the form of consumer applications containing sensitive company data moving on and off the network. The integration of contact centers and UC traditionally sat in silos within the enterprise. 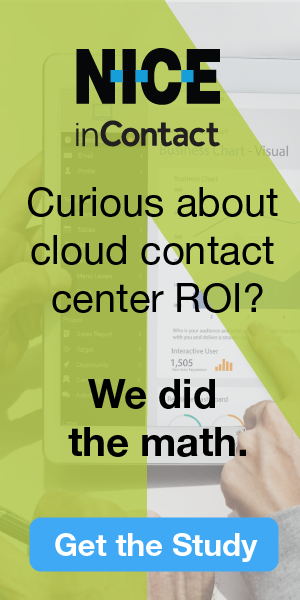 With cloud now mainstream, where essentially contact center and UC are now fundamentally software entities, these silos need no longer exist, enabling workflow collaboration amongst contact center agents and the rest of the company to deliver contact resolution and better customer experiences. The cloud is enabling enterprises to deploy services more quickly to workers by removing internal operational requirements for new hardware or software. It can enable IT to rapidly evaluate new technologies to keep end users up to date with the latest offerings. It sounds flexible, but will only stay that way while UC vendors commit to an open standards approach that promotes compatibility and interoperability with legacy systems and popular call servers, for example. Contact centers that focus on the customer experience and enable agents to deliver the highest levels of satisfaction via today’s advanced UCC solutions will achieve greatest brand loyalty and recognition. Looking ahead, contact centers should be measuring themselves on business outcomes, not standard efficiency-led metrics. Contact centers exist to deliver on specific business objectives, so should not center too heavily on facts and figures that calculate the utilization of resources. With the wealth of information available online, customers are better informed and expect a much higher level of service from better informed agents. The downside to failure isn’t just lost revenue, it could be a viral backlash via social media. Expectations continue to rise and contact centers must invest in systems and processes that allow them to meet these demands. The focus of a contact center should remain at all times on servicing customers, whether in the form of sales, retention or support. Breaking free of the shackles of legacy infrastructure by moving to the cloud and creating workflows that center as much on the agent as the customer are great ways to enable a contact center manager to refocus on what is important—the overall customer experience. Most organizations want a more modern work environment, which can adapt to employee preference. Create opportunities for more transparency and communication, as well as an employee community for enhanced collaboration, so work becomes more meaningful and interactive. That is the key to success. Todd Cotharin was one of the original founders of The Workforce Management Software Group, Inc. (WFMSG) in 2005. Prior to WFMSG, Todd worked for Cybernetics Systems and held the position of Director of Customer Service. He also managed multiple contact centers for Citibank. Todd has both designed and influenced a number of workforce management solutions and is a widely recognized industry thought leader.